"Thinking and winning do not mix." Profile: Awesome and terrifying, Devastator is the bizarre result of the six Constructicons - Scrapper, Scavenger, Bonecrusher, Hook, Long Haul and Mixmaster - joining together to form a single giant robot. He is ungainly and plodding, but he is also brutality in its purest form - a mechanical being whose sole purpose is to crush and destroy all that stands in its path. Devastator's mind is truly unique and his own, a melding together of his six components, but it also represents a compromise: his thoughts are limited to what the six can agree upon. The carrying out of any complex thoughts is severely impeded by their competing minds. Thus, Devastator is seemingly a creature of almost pure instinct - usually he acts before he can fully contemplate the consequences of his actions. These actions are usually simple, direct and extremely violent. 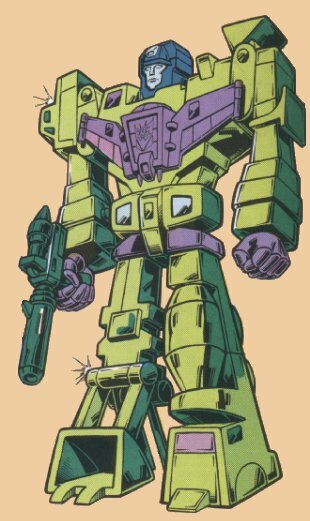 Abilities: Devastator has many of the abilities of his component parts, but is somewhat limited in their use by his limited mental functions and awkward form. He is over 60 feet tall and has incredible strength - he can knock down a bridge with one punch. His solar energy rifle shoots a 10,000 degree centigrade heat beam a distance of six miles. Weaknesses: Devastator is slow and awkward, and is relatively easy to trip up. The inability of his six component parts to better cooperate inhibits his mental functions, allowing him to be easily outfoxed by most opponents.